Posted by Marc Lee under heterodox economics, PEF. 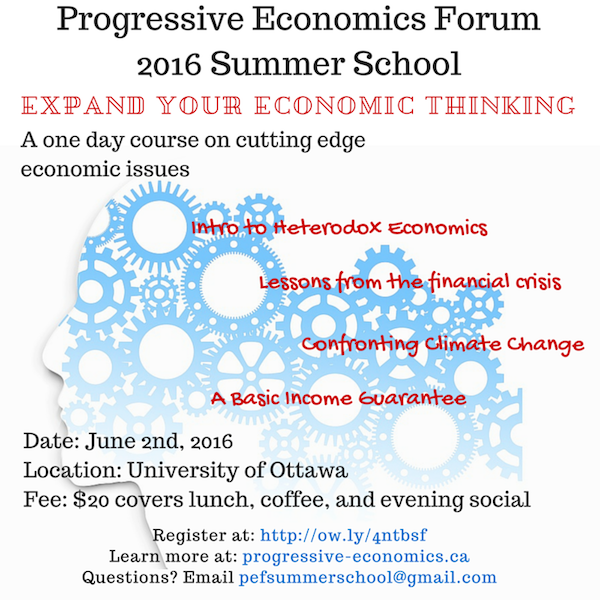 If you are in Ottawa or close by, and are interested in the ideas and debates that are shaping today’s economy, then we have a summer school for you. Learn in a day what you may have missed from a year of regular classes about the cutting edge economic issues that everyone is talking about. Basic Income Guarantee: a policy idea whose time has come? If you are an economics student (undergraduate or graduate), a student interested in economic questions or a practicing economist in academia, the labour movement or with an NGO, this summer school is for you. Registration is $20, covering lunch, refreshments and one drink at the evening social. Out-of-town participants are responsible for their own travel costs; however, limited travel scholarships for one-night accommodation may be available for select participants. With secular stagnation and rising inequality being hot topics in the public conversation, there is a renewed interest in economic growth and distribution. But does the conventional approach to understanding growth restrain us from exploring the complexities of how growth and distribution are related? This introductory lecture shows that there is more than one way to bake a pie and cut it too. 10:35 – 12:05 p.m. Basic Income Guarantee: A Policy Idea Whose Time Has Come? Fundamentally, poverty is about lack of income and poverty impacts everything from hospitalization rates to food security. Perhaps sending low income families a basic income could be the answer. Then again, maybe that approach is a false promise. This panel will debate the issues. Ecological economics integrates considerations of efficiency, equity, and biophysical scale in ways that identify paths to achieving a sustainable future. This session introduces approaches and techniques developed in this field to help illuminate and resolve pressing environment-economy tensions. 3:05 – 4:45 p.m. Is Economics Changing? Lessons from the Financial Crisis. Many observers said the 2008 financial crisis exposed the weaknesses of the dominant economic orthodoxy, further pressing the need for a new economic thinking. But eight years after the crisis, has the teaching and practice of economics really changed? This panel will weigh in on this question.